Pissaladiere is a Provencal onion tart that is usually flavored with anchovies. The vegetarian recipe we used utilized a pizza crust as the base and olive tapenade to replace the strong, salty flavor of the anchovies. We chose to put sheep feta tossed with fresh parsley as the other topping. 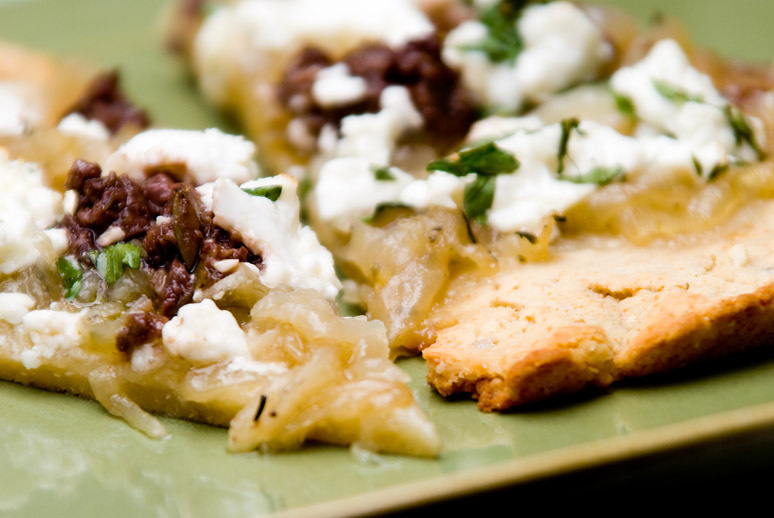 The combination of the soft, mildly sweet, slow-cooked onions with the salty olives and feta was a palate-pleasing combination. Our salad side to go with that pizza was orange and grapefruit pieces with avocado and mint tossed in a sweet raspberry dressing. It was only okay. Sometimes a girl just wants a traditional pizza, and the night Dan and I made the next pizza, it really hit the spot. We used organic, pastured chicken sausage slices, goat mozzarella cheese, and organic tomato sauce that I doctored with balsamic vinegar, a pinch of brown sugar, fresh rosemary, and other dried Italian herbs. Dan said he thought it was tastier than a good restaurant pizza. 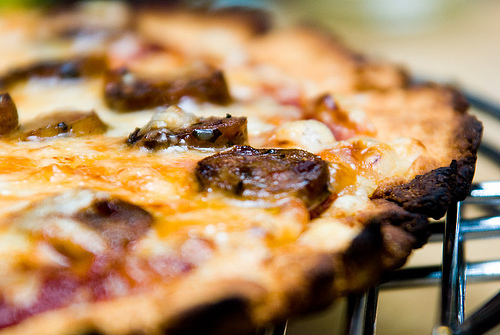 I consider nearly anything pizza if it’s got a savory element and is tossed on something that resembles a pizza crust. So our veggie Mexican pizza hit the spot. I used Alanna’s sweet potato salad recipe, adding corn and black beans, removing the greens, and tossing the veggies with the dressing and soft sheep cheese before spreading them on the pizza. We found the combination quite satisfying. If we make it again, I’ll use soft goat cheese instead. (And if you’re thinking, “Corn on pizza?” Corn on pizza is eaten in Japan and some parts of Europe and called ‘American pizza.’ So I say let’s embrace it! Oh, and while I’m posting food photos, I have to share my latest flop. Several of you had asked me about a recipe for the nutella spring rolls. I didn’t have one to offer because I was making it up as I went along. I make my homemade, dairy-free nutella by blending melted dark chocolate and hazelnut praline. 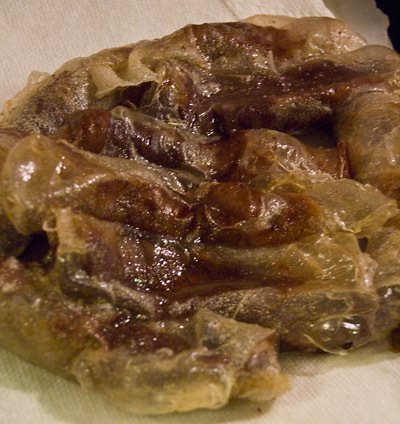 For this dish, since I can’t have gluten or eggs, I used the rice paper spring rolls. I had a good technique: freezing the nutella mix, chopping it into pieces, placing those pieces in the rolls (brushed with ghee), rolling them up, and freezing them for a few more minutes until frying time. The consistency of the nutella came out great. (Nutella that’s not frozen can burn in deep-frying.) But the rolls themselves—they all stuck together in the pan, and they looked like–well, like intestines . . . intestines in the latter stages of digestion. 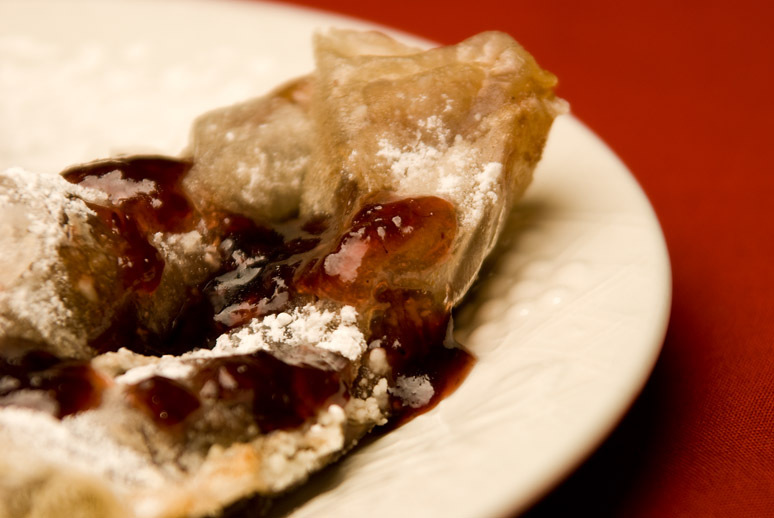 We soldiered on, coating them with powdered sugar, pulling them apart, and serving them with a raspberry sauce. All of it was delicious except for the spring roll skins! They were far too crunchy and not chewy enough and just . . . did not work. But it was a fun attempt, and we all at least ate the creamy filling out of them, anyway. 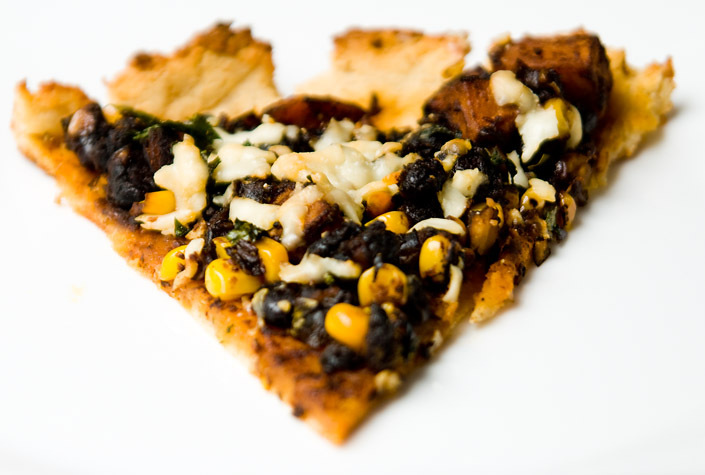 That black bean/corn pizza looks delicious. Hey, at least you got the yummy middles to eat. And I admire anyone who experiments with food. Keep at it! One of my favorite meals that Dan and I make is a Provencal pizza very similar to the one described above, though we have never added feta–I will definitely try that next time! All the pizza looks great.. and yes, you definitely win some and lose some. I know I’ve had my flops, but they are definitely a good thing in the long run. My mouth is watering and it’s still hours till lunch — yikes. Those pizza’s look amazing and you made your nutella roll “flop” look delicious with your additions! Great stuff. I, too am working on a homemade dairy-free nutella; we’ll see how it works out! Yummy!!! It all looks and sounds soooooo delicious. I hate cooking (though I like eating). I just can’t seem to motivate myself … sometimes the mood strikes me and then I go crazy in the kitchen but mostly my meals are similar to what a monastic order would call home cooked ( LOL). With all of the modified cooking you do I can’t believe you don’t have MORE flops to report! Seriously….all of your food looks insanely delicious…..especially those pizzas!!! What’s your favorite pizza crust?